Michigan's Trey Burke is the most NBA-ready point guard in the 2013 class. "It's not that I don't trust you, Otis ... I ... I don't trust you, Otis." I know how the greatest criminal mind of our generation feels. This is the time of year when you have to pick up the phone and call/text people who are determined not to tell you what they're actually thinking. You have to do this because while the rest of Earth is celebrating/lamenting March Madness, the clock is ticking toward the June NBA Draft, and it's time to start ranking prospects. It does not bother me that people are lying. I expect it. Like I expect animals to wallow in mud and fling things at me if I get too close to them. It's what they do. Very few people are going to honestly tell you the players they like in a regular year. But the new Collective Bargaining Agreement makes keeping one's Draft picks even more valuable -- rookie players are on rookie deals, which can go as long as five years, and having such players on your roster is essential to having any chance to maintain salary cap discipline. So we start counting down to this year's Draft, which is devoid of the obvious top picks of recent years (Anthony Davis, Kyrie Irving, etc. ), but has more than enough good-to-very-good prospects. Someone will explode on the scene. Someone will come on gradually during his first two years and eventually become an All-Star. It always happens. It will happen this year. Regular readers know that we've modified our position around here at NBA.com, now adding "one-and-done" and other early entries that most around the league believe will declare for the Draft before next month's deadline. There are so many mock Draft (and this is not one; more on that below) out there with underclassmen that listing them here is not going to be a tipping point in their decision making. (The listing "Some Scouts Like" will refer to players who are not certain to declare, but who are viewed as potentially draftable if they do. Emphasis on "potentially.") We want to be as accurate and as early as possible with what we think is the correct ranking of all the likely entrants in the Draft. So we list underclassmen that most NBA scouts and personnel people believe will enter the Draft, or are seriously considering entering the Draft. As ever, we will start with point guards, and continue every other week with the other positions, alternating with the weekly Morning Tip column. Again: This is not a mock Draft. They are a complete waste of time, especially this far removed from June. Who knows what trades will take place between now and then that could impact a team's Draft needs, or what players have incredible individual workouts that send them high up on the board? (Having said that, I commit to embarrassing myself yet again and trying a mock draft a little bit before the real one in June. You seem to like it.) This is a rough consensus of what NBA personnel people, GMs and coaches, and college coaches that I trust -- and who obviously can't be quoted by name -- believe is the pro potential of this year's crop of players. UPDATE (5/20): A strong showing in Chicago at the pre-Draft combine last week helped both European guard Dennis Schroeder and Miami guard Shane Larkin, who each moved up on the Big Board. Larkin impressed with his test scores, including a 44-inch vertical leap and very strong bench press performances, and Schroeder's 6-7 ¾ wingspan was longer than all the other point guard prospects except Illinois' Brandon Paul (6-10 ¼). Murray State's Isaiah Canaan was equally impressive to teams during his interviews, telling his compelling life story with grace and equanimity. He's solidified himself as a first-rounder. MAY 20 UPDATE: A strong showing in Chicago at the Pre-Draft Combine last week helped both European guard Dennis Schroeder and University of Miami guard Shane Larkin, who each moved up on the Big Board. Larkin impressed with his test scores, including a 44-inch vertical leap and very strong bench press performances, and Schroeder's 6-7 ¾ wingspan was longer than all the other point guard prospects except Illinois' Brandon Paul (6-10 ¼). Murray State's Isaiah Canaan was equally impressive to teams during his interviews, telling his compelling life story with grace and equanimity. He's solidified himself as a first-rounder. APRIL 22 UPDATE: There have been a few big changes on the point guard Big Board from the original posting. With the decision of Oklahoma State freshman guard Marcus Smart to return to Stillwater for his sophomore season, the top point guard prospect in this year's Draft is now Michigan sophomore Trey Burke, who led the Wolverines to the national championship game. And everyone else in the top six also moved up exactly one spot, with Syracuse's Michael Carter-Williams now second overall, all the way down to international prospect Leo Westermann, who is now sixth. Entering the Big Board behind Westermann is 19-year-old German guard Dennis Schroeder, who declared for the Draft late last week and quickly justified that decision with a strong week of practice and play for the World team in the Nike Hoop Summit in Portland. Schroeder plays in the German Bundesliga for the wonderfully named New Yorker Phantoms Braunschweig. His home team isn't doing so hot this season, but Schroeder opted to take the plunge anyway, and he more than held his own in Portland, showing speed, good shot selection and decision making. He got into the lane and was able to get to the basket despite his small frame. He could be a very good "stash" pick if a team wanted him to get another year of seasoning overseas. Also moving onto the point guard Board is Texas sophomore Myck Kabongo, who could get some attention in the second round. Scouts were nearly universal in their impressions of Kabongo -- they all hoped he would return to Austin for his junior season. While Kabongo is very talented almost all NBA types don't think he's ready for the pros. But he has declared for the Draft and is likely to go somewhere in the second round. Also helping himself immensely in Portland was Russian guard Sergey Karasev, who may have played himself into the middle of the first round -- perhaps as high, according to one GM, as the late Lottery. For that reason we've moved Karasev up to fourth on the shooting guard Big Board, which originally posted April 8. In addition, Washington sophomore two guard C.J. Wilcox, who had thought about entering the Draft and had some support among some NBA talent evaluators, pulled out of the Draft and will return to the Huskies next season, and has been removed from the two guard Big Board. There's been a sea change at the game's most important position. It is no longer enough for an NBA point guard to be a creator, getting open shots for his teammates, only looking for his shot if there are no other options available. Now, with guards liberated from hand-checking and just about any defensive impediments to the basket, and colleges thriving with guard-friendly offenses like the dribble-drive, NBA teams look for guards who can score just as dutifully as they once beat the bushes for floor generals. It is no fluke that the first point guard taken first in the last five NBA Drafts -- Damian Lillard (2012), Irving (2011), John Wall (2010), Tyreke Evans (2009) and Derrick Rose (2008) -- could all get to the basket effortlessly. And with more teams going to smaller lineups, smaller guards are finding they have a place in today's NBA. Just a few years ago, Phil Jackson famously preferred big guards at both positions to run the triangle offense. But today, diminutive guards like Ty Lawson run playoff teams. The Bucks start (allegedly) 6-foot-1 Brandon Jennings and 6-foot-3 Monta Ellis in the backcourt, and haven't been abused defensively. Isaiah Thomas (5-foot-9) and Nate Robinson (5-foot-9) are starters and parts of rotations. Those dynamics make this year's Draft deeper at point guard than in previous years. There may not be an obvious Rookie of the Year talent here, but there are plenty of guys who can put the ball in the basket, from Murray State's Isaiah Canaan to South Dakota State's Nate Wolters; both were in the top 10 in the nation in scoring this season. But there is no consensus at the top of the Big Board. This year, four point guards are in the top group: Michigan sophomore Trey Burke, Oklahoma State freshman Marcus Smart, Syracuse sophomore Michael Carter-Williams and Lehigh senior C.J. McCollum. Each of them is the top choice of at least one team with whom I spoke. Burke has impressed NBA scouts all season with how he's managed the Wolverines, a team filled with pro prospects. They've been in the top 20 all season, and reached the Sweet 16 Saturday with a devastating 78-53 blowout of Virgina Commonwealth. Michigan's Trey Burke bypassed the NBA Draft last year and is likely to be a lottery pick this June. Burke is currently tied for second in the nation in assist-turnover ratio (3.11), just behind North Carolina's Dexter Strickland, and Burke is 11th nationally in assists (6.7 per game). But he led all Big 10 guards in scoring at 18.8 per game, averaged 20.2 points in Big 10 games and was the conference's Player of the Year. He also was named Sports Illustrated National Player of the Year. Burke had scored in double figures in every game this season until making just 2 of 12 shots for six points in Michigan's opening-round NCAA game against South Dakota State. Burke thought about entering last year's Draft after his freshman season, but wisely went back to Ann Arbor to work on his game. Had he entered last year, he likely would have been a second-round pick. Now, he's a lock to be in the lottery, despite being under six feet (few believe his listed 6-foot height). "Unless you know of a way you can improve on 5-11, there's nothing you can do about that," a Central Division personnel man said. "The number one thing he's done is he's leading his team. He's shown he can lead a team into a very successful season. He's one of the most talented point guards in the Draft." Said a Northwest Division personnel man: "He's an extremely hard worker, gym rat, has a competitive spirit that he wants to get better, wants to be one of the better point guards. And he worked at it. (Michigan Coach John) Beilein gave the ball and let him make his mistakes, and he grew in confidence." Burke's ability to create space and get his shot off also bodes well for his pro prospects. Some teams believe Burke is the best player in the Draft, period. "If Burke was 6-foot-2, 6-foot-3, we wouldn't be having this conversation," a Southeast Division executive said. "These are the same questions as when Chris Paul was coming out. [Burke]'s a very clever basketball player. You watch him play, and you've got to go back to when Chris was coming out of college ... Burke already knows how to play screen and roll better than most college kids. And he must have been watching film on Chris. When [Burke] gets around the first guy, he immediately gets in front of that guy and keeps that guy on his back. He keeps his dribble alive and surveys what he sees. Those little things, those are hard to teach. He does it time and time again." "You question what is he going to be able to defend -- starting guys or backup guys?" the Central Division personnel man says. "There aren't that many 5-foot-11 starting point guards. I think that will be the toughest thing will be the workouts. The guys in his range are Marcus Smart and Michael Carter-Williams, and one of them is 6-foot-6 and the other is 6-foot-3. Don't get me wrong; I do think Burke is talented enough that teams are going to want to figure out a way for him to be their starter." Indeed, with their size, Smart and Carter-Williams are more prototypical NBA lead guards. Smart was the Associated Press Big 12 Player of the Year and Rookie of the Year -- only the third player in that conference to win both honors in the same season (Kevin Durant and Michael Beasley did it last). He was named first team All-America by The Sporting News and is second in the country in steals (3.0), behind only Oakland's Duke Mondy. At 228 pounds, Smart could double as an NFL safety. But his size doesn't affect his agility. Smart lost an older half-brother to cancer and nearly lost his brother to drugs, but he overcame those tragedies and his own issues to win two state titles at Marcus High in Texas. He helped lead the United States Under-18 team to a gold medal in Brazil last year before becoming one of the country's best players at Oklahoma State. "When he was in high school, I watched him a lot," said a college coach whose team played Oklahoma State this season. "He's not Jason Kidd, not the passer Jason was, but he's every bit the winner, and maybe more. I saw him make Shabazz [Muhammad, the blue-chip recruit who went to UCLA this season] absolutely quit. Besides Forte [guard Phil Forte, who joined Smart at Oklahoma State this season], he had a bunch of low Division I guys, and he absolutely made Shabazz's team quit. He's an absolute stud." Smart is a jack-of-all-trades guard, one who can defend as well as pass. He oozes intangibles that make NBA types believe he could run a team full of grown men right away. Many liken him to a more athletic Andre Miller. "Coaches are going to love him," an Atlantic Division executive said. "I don't get overwhelmed by his talent but I can see where he's going to be a good player. And coaches are going to love his size ... to me this kid brings so much more to the table than Kendall Marshall. The only thing he doesn't have is the floor vision. Great body, defends the hell out of you, tough as nails." But the questions on Smart as an NBA player start with a simple one: Can he shoot? Smart shot just 40 percent at Oklahoma State this season, and just 29 percent on 3-pointers. But bad shooters can get better. Smart will have to. "People have done a little homework on the kid, they say he's supposed to be a super kid," one Eastern Conference executive says. "He is the [Michael] Kidd-Gilchrist of the draft this year -- intangible guy, he looks tough, all these things. But the talent is not there, I'm sorry. The guy [Smart] is stiff. He's not truly a one. If anybody gets into him, he struggles. If I'm OKC, I can go draft him [late in the first round], and now he'd be my guard off the bench, and he can give me a little two guard play. If you take that guy in the top five, you may say he's just not good enough." And while one game doesn't overcome a season's work, the Cowboys' first-round exit to Oregon in the Tournament doesn't help. "When you take him out of the Oklahoma State program and put him in an individual workout, all the intangibles, the leadership, the toughness -- you take that out and now it's just, are you better than this guy?" another East exec asks. "At some point in the NBA, if you were to say who are the top five leaders in the NBA, they were all extreme talents -- CP and Rondo and Chauncey Billups and those guys, they had the intangibles, but you have to have the talent, too, with men." Carter-Williams sat much of last season behind upperclassmen Scoop Jardine, Brandon Triche and current Cavs guard Dion Waiters, who turned his sixth-man role last year at Syracuse into becoming the fourth overall pick in the 2012 Draft. With Jardine, a fifth-year senior last year, also gone, opportunity opened up this season for Carter-Williams, and he made the most of it. A prodigious scorer in high school, Carter-Williams has quickly adjusted to becoming a distributor -- he's currently third in the nation in assists per game (7.6), and has eight double-doubles this season for the Orange, which advanced to the Sweet 16 Saturday with a win over Cal. "He has a gift for sharing the ball, great vision, and of course his size," a Pacific Division scout said. "He's thin and all that, he doesn't shoot the ball well, and he makes careless turnovers. But he has a gift for sharing the ball." As with Burke, scouts are impressed by how the 21-year-old Carter-Williams has quickly developed into a leadership role at Syracuse. "Essentially, he's a sophomore who didn't play much last year," a Northwest Division executive said. "He's leading an older group. I like his size. There's a lot of plays he's not completing right now, but it's inexperience and youth. He'll get stronger. He plays with his teammates and tries to get them involved." Carter-Williams does average 3.5 turnovers per game. But many talented point guards have high turnover numbers, in part, because they try harder passes than less-talented players. Carter-Williams' shot also troubles some NBA types. Though he has shown he can turn the corner on screen-and-roll plays, he shot just 39 percent this season, including an abysmal 27.9 percent on 3-pointers. "You think guys like that will become at least decent long range shooters," the Pacific scout said. "If they do, they become a problem, because if you come out on them they can go by you." Many compare Carter-Williams to Shaun Livingston, the 6-foot-7 phenom who opted not to go to Duke and entered the 2004 Draft. Taken fourth overall by the Clippers, Livingston's career was sidetracked by that gruesome knee injury he suffered in 2007. He's since established himself as a solid rotation player for many teams, most recently in Cleveland. 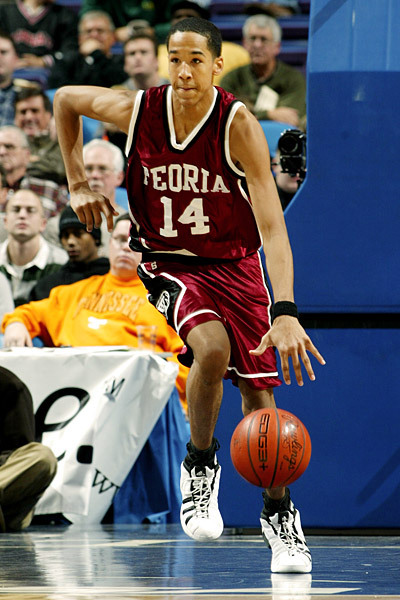 Part of the comparison of the two may simply be visual -- both are tall, light-skinned guards (here and here, when Livingston was in high school). But before his injury, Livingston was freakishly athletic, moreso than Carter-Williams is. "There was a little bit more pure point guard in Livingston than there is in this kid," a Pacific Division executive said. "There's some two guard adjustment history [with Carter-Williams] that's still taking place." And, as with almost all Syracuse players, Carter-Williams will have to show he can play man-to-man defense in the NBA after sitting back in the Orange's notorious 2-3 zone. "The question is whether he can play any kind of defense because of the Syracuse zone, but he does lead the nation in steals," a Northwest Division scout says. "At that same stage, Shaun was a better player. They both were not very good shooters. The other thing with Shaun, he handled the ball a lot better. Michael's a little bit loose with his ball handling. He's got to get a lot better." The consensus -- if there is one -- is that it may take Carter-Williams longer to adjust to the NBA game than it will Burke or Smart. But Carter-Williams may have the highest upside that trio, so the team drafting him must be patient. "He has potentially the most ceiling," a Central Division executive said. "But so many things would have to go right. Starting with, you don't go to a [bad] team that just throws you in. He would start for Charlotte, certainly. But is that the right thing for him to do?" McCollum introduced himself nationally with his 30-point performance in the first round of last year's NCAA tournament, as his 15th-seeded Lehigh team shocked second-seeded Duke. The two-time Patriot League Player of the Year was poised to have an even more impactful senior season after spending the summer at Chris Paul's point guard camp, where McCollum stood out among players including Burke and Canaan. But McCollum's senior year only lasted 12-plus games. He was leading the nation in scoring, averaging 25.7 points a game, when he broke his left foot in a game Jan. 5 against VCU. He didn't return for the Mountain Hawks, who dropped to third in the Patriot League and lost in the conference tournament. Lehigh's season ended with a one-point loss at Wyoming in the opening round of the CIT. McCollum had put his name in last year's Draft, but pulled out in order to get his degree. Last year, he was a likely second-round pick; now, he's a strong favorite to go in the lottery, even with the season-ending injury. McCollum showed scouts in three years what he could do. "If he's a point guard, he comes after the top ones in my mind, and he may come ahead of Carter-Williams," a Central Division executive said. "Any time you're not overly athletic, missing this much time and coming back from an injury is certainly daunting. [But] I saw him play some good, tough teams. I wasn't ever positive he's a point guard, but I was always convinced he's unequivocally a basketball player." Another executive likened McCollum's plight to a "Kyrie Irving situation," referring to Irving's being limited to 11 games in his one season at Duke because of a toe injury. But Irving was nonetheless the overwhelming No. 1 choice in 2011, and the Cavaliers followed through, leading to Irving's Rookie of the Year season. "Obviously he's got a bigger body of work because he'd been in college," the executive said of McCollum. "But I would say it's always a benefit when you see those guys in the summer, like the Nike thing. C.J. was very good at those things, with all the top guards in the class. And he stood out. As long as you're comfortable that he's healed from his injury, I think the guy can play. His play is really kind of made for this level. Would you like to have the full sample size from the full year? That would be terrific. But I think the guy can play. I've seen enough to believe that." The 6-foot-3 McCollum projects as a classic "combo" guard, able to play both positions. He could be effective playing off of another guard who's a better ballhandler as McCollum is more than capable in both getting to the basket in one or two dribbles or coming off flare screens for jumpers. As a freshman at Lehigh, McCollum was almost exclusively a scorer. But in his last two full seasons there, he became a much better passer; his assists rose from 2.1 as a sophomore to 3.5 as a junior. "He always makes good decisions," the Central executive said. "He's not Steph Curry, but he may be a rung below that in a similar fashion. I know for certain that guy does not fail to be a rotational player in the NBA on a good team." And the injury may perversely have helped McCollum in one respect; as a scout said, not being on the court this season has kept people from picking his game apart all year. In the right NBA system, Murray State's Isaiah Canaan looks primed for a star turn. • After the top four, many scouts like Isiah Canaan (pronounced cannon), a flat-out scorer who is sixth in the country in points per game (21.8). Like so many others, he explored entering the Draft last year, but returned to Murray State for his senior season. He was the co-Ohio Valley Conference Player of the Year with Belmont's Ian Clark after winning the award outright as a junior. Canaan got the endorsement of Paul earlier this year when Paul said Canaan was "wasting" his senior season playing in college. Like Burke, Canaan will have to answer questions about his size. "He's not much bigger than Trey," one scout said. "He will get a look because of all the point guards, he might be the best shooting point guard out there. If he's in a system that has a strong post up player, utilizes a lot of spot ups, he can play in that system." But one Pacific Division exec believes that Canaan is an "overrated" player. "It's not that I dislike him. I just think he's overrated by quite a few people," the executive said. "A lot of people have him in the first round. I'm not sure I wouldn't take Wolters over him. I'd be in the minority. Now you catch him on the right game, he'll shoot the piss out of it. But I don't think he gets it off real quick. He's got to get his feet set. And I think he makes the league at some point." • N.C. State's Lorenzo Brown has driven scouts crazy with his inconsistency. On the plus side, he led the ACC in assists (7.2, sixth in the country) and was a second-team all-ACC selection by the conference's coaches. He returned to Raleigh for his junior season to try and lead a young team. But after winning 10 straight games early in the season and getting off to a 15-2 start, the Wolfpack were a .500 team from there, losing to Miami in the ACC Tournament semifinals and falling to Temple in the second round of the NCAAs. "I like his handle, his creativity," an Eastern Conference executive said. "Good size, good body, and he's creative. But I'm not overwhelmed by him. You have to give him some of the credit and some of the blame, because he's the guy supposedly controlling the ball and controlling the other guys." With his size, Brown takes chances as a passer, with up and down results. "In the halfcourt he thinks he's Betsy Ross, but he's not," says a college coach who's seen Brown play frequently. "He's a good seamstress, but he's just not Betsy. He can't get it in every nook and cranny he tries to get it in. But he sees it. In the wide-open court, because he sees so much, he sees what he needs to see and he'll make the right play." But Brown has to convince teams he can be an everyday player. "He's got the size," another executive said. "He's a great tease, because you can watch him sometimes and think, 'man, this guy could be really good.' He's got the size, the length, got some wiggle. It's been a real consistency thing with him. I've seen him too many times where he disappears, and other times he looks really good." Instead, Westermann shocked much of Europe by signing with Partizan Belgrade, one of the top clubs in Europe and which plays a much tougher Euroleague schedule. Partizan has sent a who's who of European players to the NBA over the years: Vlade Divac, Zarko Paspalj, Nenad Krstic, and, more recently, Minnesota's Nikola Pecovic and Washington's Jan Vesely. Westermann has played well for Partizan this season and he's certainly got the size to make the transition to the NBA as another European point guard, Alexey Shved, has done this season for the Timberwolves. But Westermann is not a great perimeter shooter and he'll have to prove he can defend other point guards. "Westermann's pretty good," said the executive of an NBA team that is not looking to draft a point guard. "He's a tremendous pick-and-roll player. He's really surprisingly tough. The number of French kids who go to Serbia to get tougher competition is not very big. He can make shots [but] he's not a scorer ... he's not a great athlete, but he's huge. He can split the double. He doesn't turn the corner much, but he can split the trap. He's smart enough to drag it out, and he delivers a really good ball." • Baylor's Pierre Jackson and Miami's Shane Larkin may have had the two best individual seasons of any point guards in college basketball this season. Baylor had to regroup this season after losing Perry Jones III (Oklahoma City), Quincy Miller (Denver) and Quincy Acy (Toronto) to the NBA. But Jackson, the preseason player of the year in the Big 12, had a strong season. He was 20th in the country in scoring (19.7 ppg) and tied Burke for 11th place in assists (6.7). Jackson was a second-team all-Big 12 selection, but the Bears didn't get out of the first round of the Big 12 tournament and were left out of the NCAAs. The Bears got an NIT bid and have reached the quarterfinals, with wins over Long Beach State and Arizona State. Jackson had 26 points and 16 assists in the win over ASU last Friday. Jackson is even shorter than Burke, but his ability to get to the bucket will get him a look in the pros. Not too many college players were able to stay in front of him, and he could be a classic change-of-pace third guard. "I know that his size will be an issue, but that kid is a game-changer," one Eastern Conference general manager said. "You can always say at worst that he's your third guard. To me, if he's not good enough as a solid backup point, I know he'll be good enough to be a Nate Robinson-type to go in there and mess things up and change the tempo. He's had some real good moments." • No one expected much this season out of either Miami or Larkin, the son of longtime Cincinnati Reds Hall of Fame shortstop Barry Larkin. But both made huge strides. The Hurricanes were the talk of college basketball much of the season, dominating the ACC and then winning the regular-season and tournament championships, with Larkin winning tournament MVP honors. Miami had a No. 5 ranking in the AP poll and earned a No. 2 in the East Region of the NCAAs. On a Power Six conference team full of juniors and seniors -- quite unusual these days in college basketball -- the 20-year-old sophomore is the Hurricanes' unquestioned leader, shooting almost 41 percent on 3-pointers. He hit a cold-blooded 3-pointer late in Sunday night's win over Illinois that vaulted Miami to the Sweet 16. Some scouts see a lot of Jeff Hornacek in Nate Wolters' game. "He's just gotten better and better and better all year long," a Western Conference scout said. "He's strong, knows how to play, can shoot it, can pass it. He's an interesting player. I think he makes our league. All these guys, I'm not sure how many of them would be considered starters or stars. Not only the point guards, but most of this draft you're looking at role players, backup players." • South Dakota State's Wolters has been a monster scorer for the last couple of years for the Jackrabbits, a distinction he made clearer this season with a 53-point effort against Indiana University-Purdue University Fort Wayne, the biggest scoring game in the nation this season. Wolters led SDSU to the NCAAs again, finishing fourth in the country in scoring at 22.4 ppg. And despite having to carry the scoring load, Wolters added 5.8 rebounds and 5.6 assists per game, shooting better than 48 percent from the floor, as the Jackrabbits ran through the Horizon League. Though there are the usual questions about his ability to guard quick points, Wolters has some strong NBA supporters. "I think he's a little better than people might want to believe," a Pacific Division executive said. "He's got enough size for the position. He's got skills. And he can shoot it ... putting that ball in the hole, that's what it's all about." Another executive said Wolters reminded him of former Jazz guard Jeff Hornacek. "He's better defensively than you think," the executive said. "There's a reason Burke struggled the other day [Michigan beat SDSU in the second round of the tournament, but Burke shot just 2 of 12 from the floor, with Wolters checking him frequently]. I think Nate is a cut above the rest of the [late first-round] names. His size, his feel, his scoring ability is better, I think ... his jumper is a little low and in front of him, but it's something that can be fixed easily. He doesn't sit down and slide defensively, but he's much quicker than people think. I think he's going to be much better in the individual workouts than people think." • Nevada's Burton put up big numbers last season as a sophomore, when he won WAC Player of the Year honors. He raised his numbers higher this season, including back-to-back 27-point performances in Nevada's last two games of the season. "He makes big plays down the stretch," said a college coach who played against Nevada this season. "Physical guard. Not a blow-by guy; he's the kind of guy who gets you on your hip. He's a hell of a college player. I don't know if he's got that other gear that guys need at that level. But he's got that pro mentality. If he gets you on his hip he can pretty much do what he wants to at this level." • Dellavedova has developed into one of the best leaders in the country, after four stellar years at St. Mary's and a stint on the Australian Olympic team last year. He is not the quickest Draft prospect ever, but in a league where the screen and roll is used, conservatively, 60 percent of the time in the typical NBA halfcourt offense, few run it as well as Dellavedova. His 6.4 assists per game tied for 16th-best in the country. Scouts believe Dellavedova has struggled as his team's competition has gotten tougher, and the general consenus is that he's a second-rounder who may need to play in the NBA D-League or overseas. • Kansas' Johnson showed he could score, ringing up Iowa State for 39 earlier this season, and being named an honorable mention all-Big 12 selection. But he'll have to show he can run a pro team. Some scouts like Johnson better than Tyshawn Taylor, who was drafted last year by Portland in the second round and acquired by Brooklyn. • Ray McCallum, Jr., the son of UD Coach Ray McCallum, Sr., has great speed and can attack the basket. He dominated the Horizon League, winning preseason and regular season Player of the Year honors, and was a top-40 scorer nationally at 18.7 ppg. As you would expect from the son of a coach, McCallum, Jr., knows the game inside and out, and he could find a home late in the first round or early second. • Green is a player that doesn't have a natural NBA position. He led the nation in scoring this season, dropping 25 a game for the Hokies. But at 185 pounds, he's a few milkshakes short of the typical NBA two guard. Yet he's not shown consistent NBA point guard skills. One scout thinks Green could be a "poor man's Lou Williams." • Paul may be in a similar boat. He dropped 35 at Gonzaga this season, as Illinois gave the Zags their only home loss of the season. And he gave Miami all it wanted Sunday night in the second half of their third-round NCAA game. But Paul may wind up being an off-guard prospect in the pros. • Lyons transferred from Xavier to Arizona after he graduated from Xavier in three years, going to grad school in Tucson while using up his final year of college eligibility, and playing for his former Xavier coach, Sean Miller. A scoring guard at Xavier playing next to Tu Holloway, Lyons has had to adjust to playing point guard at Arizona. He's still more scorer than distributor, leading the Wildcats to the Sweet 16 after scoring 27 in Arizona's win over Harvard Saturday. • But, again, that's what a lot of NBA teams are looking for, which is why Minnesota's Hollins, who had 10 games of 20 or more points this season -- including 41 against Memphis and 25 in the Golden Gophers' round of 32 loss to Florida Sunday -- would have some NBA interest if he opted to come out early. But there's not much first-round thought. • Phil Pressey, the son of ex-NBA player Paul Pressey (the NBA's original "point forward" who is now an assistant coach in Cleveland), was seventh in the country in assists (7.1) and led the SEC in assists, earning second-team all-SEC honors. He drives NBA scouts crazy with some of his decisions, but he has talent. "The doggone kid is a point guard with a point guard's brain," said a Western Conference admirer. "He believes he belongs. Most kids, when their dad's a player, they're not intimidated. Not all of them make it. But he thinks he belongs." • Then there's Smith, part of top-seeded Louisville's potent guard duo with senior Peyton Siva. There isn't a scout that doesn't love Siva's toughness and ability to run a team, but few think Siva can transfer those skills to the pro level. And there are few scouts that like Smith's pro potential, especially if you're asking him to be a distributor. "I just don't think Russdiculous can be trusted at all," an Eastern Conference executive said, referring to the nickname that Louisville coach Rick Pitino gave his guard for his occasionally absurd shot selection early in the season. Still, Pitino has also gone out of his way to say that Smith has matured greatly the second half of this season, and Smith indeed has looked far less "Russdiculous" in the Big East tournament and in the NCAAs. You can almost hear scouts cringing on the phone as they describe Smith's shots, but in the next breath, they have to acknowledge that Smith's fearlessness and belief he can score on anybody is exactly what he'd need to be able to make it in the NBA. "He's got a pro mentality trying to score the basketball," one Eastern Conference executive said. "There's a role for those kind of guys."